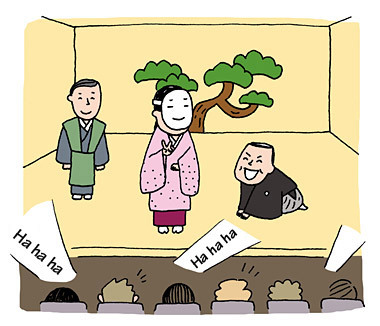 TRIVIA of Noh : Q55 : What sort of a play is Ran-no? | Home | Trivia | Q55 : What sort of a play is Ran-no? What sort of a play is "Ran-no"? In a Noh play, each one of the actors and the musicians expresses their arts they acquire in the training of their own parts and in the tradition of their own schools. Once their best performances are united on the stage, there will be a profound world view expressed with a tense atmosphere all around. However, there is a type of Noh widely different from the native form. It is called "Ran-no" (a random Noh), a special event held on memorial days and for celebrations. When a shite actor is not in the cast, he does not normally take charge of a part other than that of reciters or assistants, such as musicians or kyōgen actors. But in the entire programmes on the day of Ran-no, every performer from shite, waki, hayashi, and kyōgen plays a part not in their professional lines. For example, shite and waki actors may play musical instruments, and kyōgen actors and musicians may play the parts of leading and supporting roles. Being composed of acting out of the performers' lines, and flavoured with unique stage effects and contents, the play often moves the audience to laughter. There may be consecutive happenings, and adventurous interpretations and presentations, so the piece could be completed with a different taste from ordinary Noh plays. Ran-no is a rare performance full of a festive mood, and has nothing to do with difficulty. If you have a chance to see one, you should not miss it.